Chin State is in the southern part of northwestern Myanmar. Chin State is also known as the ‘Chin Hills’ due to its mountainous geography that has an average elevation of 5000 to 8000 feet. 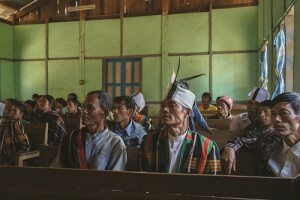 A survey conducted in 2009-10 by the United Nations Development Programme (UNDP) has found that Chin State remains the poorest state among 14 regions and states in Myanmar with seventy-three per cent of the people below the poverty line. The 2010 Multiple Indicator Cluster Survey (MICS) reports about 20 per cent of households in Chin state not using improved water sources, which was comparable to the national average. According to Knowledge Attitudes and Practices (KAP) Survey on Water and Sanitation conducted in 2011, 42 per cent of households in Mindat township are not using improved water sources and as many as 70 per cent in Kanpetlet township are not; a majority of the households in both townships cited difficulties in getting water. Chin State rates among the lowest on a number of social development indicators, where underweight counts for 31 per cent, and only 14 per cent of children have access to improved water and sanitation. Prevalence of diarrhea among children aged 0-59 months in Chin still stand at 13 per cent due to lack of access to safe drinking water. Torrential rain, starting in July 2015, and the onset of cyclone Komen has triggered severe and widespread floods and landslides across 12 states and regions in Myanmar leaving 1.6 million people displaced. The floods affected 20,449 people in Chin State, 4.3 per cent of the total population. The damage spanned across 9 townships in the state, causing widespread damage to households and basic infrastructure in the region. As a result of the floods Chin State has seen a further 4,042 people displaced to IDP camps along with 5 reported deaths from the disaster. The State capital Hakha was the worst affected region with heavy rainfall destroying 247 homes, resulting in the displacement of 1,147 people. Ensuing landslides have occurred since the flooding, leading to further hardship for locals who were attempting to restore normality in Chin State. In addition, roadblocks and the destruction of crucial bridges have been undermining necessary relief efforts and have caused a major logistical challenge for assistance delivery. The Project for Emergency Support to Poor and Vulnerable Communities in Ethnic Areas focuses on empowering communities to jointly work to build/renovate quality services (WASH and community infrastructure), and housing (affected by the 2015 floods), to give people basis for healthy and productive life. The project is framed within the overall objective of helping Myanmar’s ethnic poor and vulnerable communities to address the emergency needs to restore their normal life and to sustainably improve quality of life. The project will assist communities in the construction or restoration of existing community physical infrastructure in targeted villages. 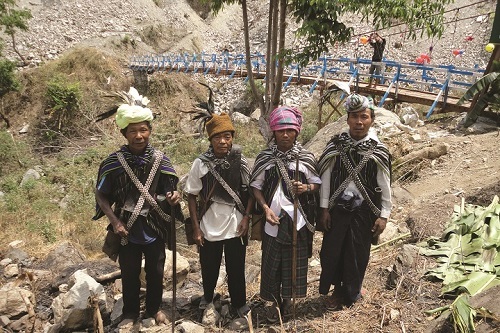 Following activities are anticipated based on the experience of the implemented work in community rebuilding work: construction or restoration of bridges/suspension bridges, renovations of roads and footpaths, construction/renovation of culverts/course ways, restoration of drainage systems to clear culverts and sites of stagnant water. These actions will improve the connectivity to township centers, rural-urban supply chain, health and educational facilities and reduce social exclusion. Provision of household solar panels to generate electricity in households in selected villages. This will also improve the safety of children, men and women, increase learning time of school children and improve quality of life. The project will support construction of school sanitation with toilets and hand washing facilities. The project will also help to improve the health and learning performance of school-aged children – and, by extension, that of their families – by reducing the incidence of water and sanitation-related diseases. WASH initiatives in schools keep the school environment clean and free of smells and inhibit the transmission of harmful bacteria, viruses and parasites. The project will also support construction of household latrines for most vulnerable households; beneficiaries will be identified by the community themselves, and the project aims to provide 10-12 latrines per village where selected beneficiaries will contribute materials and labor. The project integrates hygiene sensitization for addressing the prevailing WASH problems in targeted communities, hygiene component will address reduction of open defecation by addressing at prevention of diarrhea in children by blocking the transmission routes of germs. UN Habitat based on Chin State experience envisages that following activities will be more likely to be prioritized by the communities to increase access to improved quality and sufficient quantity of drinking water: gravity flow piped water system, cluster wells, deep-tube wells, hand-dug wells, and upgrading of ponds with fencing, stilling well and filter spillway; wherever feasible ponds will be upgraded with slow-sand filtration process and construction of overhead tank in order to provide piped water with meter to households. Furthermore, based on feasibility piped water will be connected to household premises with tariff system, this will also contribute to DRD’s ambitious goal of achieving 40 per cent rural connection to piped water by 2020. The project will also implement strategies for water evaporation (e.g. lotus plantation, contour planting, etc.) and soil conservation. Based on the UN-Habitat experience in previous post-disaster housing, communities will be able to build brick and masonry structured house with the combination of Burmese traditional wooden components. This will allow people to get involved in the construction process and contribute either with their savings or in kind such as unskilled labor or usable material of the present house. It also contributes to not only build a better quality house but also to create a sense of ownership of it. UN-Habitat will provide all required technical support through well-trained and experienced technical staff to the beneficiary families on a daily basis. UN-Habitat will ensure support on provision of technical standards, follow of agreed guiding principles, and coherent implementation modalities that promote the principle of “Build Back Safer” and “Build Back Better”, incorporating strong DRR measures to make shelters more disaster resilience, and complement government interventions. The project aims at reaching estimated 108,043 people; 90,036 as direct beneficiaries and 18,007 indirect beneficiaries from surrounding villages; UN-Habitat experience in community-driven projects has demonstrated people from areas surrounding target villages as well benefit from support provided. Connectivity restored and condition improved of basic infrastructure in affected rural communities and regained access to market, health and educational facilities. Increased access to safe drinking water and reduced incidence of water borne diseases among affected communities; increased access to adequate sanitation and promoted good hygiene practices. Most vulnerable households affected by recent floods rebuilt/upgrade their dilapidated houses where safety and living conditions of mainly women and children are improved with better housing conditions, and ensured land tenure rights.